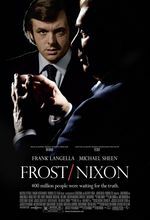 Historical drama re-enacts British talk-show host David Frost's infamous interviews with embattled ex-President Richard M. Nixon. Beleaguered ex-President Richard M. Nixon lived a reclusive life for several years following his unprecedented resignation from office amidst the Watergate scandal, foregoing countless requests for interviews in favor of a spell of radio silence back home in California. Everything changed in 1977 when Nixon unexpectedly agreed to sit down for an interview with British talk-show host David Frost after a period of hard bargaining; the adversarial relationship between an interviewer looking to grill the subject of his career and interviewee determined to eviscerate a talking head heretofore known for throwing softballs receives a big-screen treatment in Frost/Nixon.